Writing a script for a game like LA Noire takes a while, but Team Bondi is confident that it has a handle on the technical side. Capturing actors faces from dozens of angles was fine for the first LA Noire game, but Team Bondi want to go one better for the sequel and capture an actor's entire performance, without the need for a motion capture suit. The studio also says that despite this new technology, the LA Noire 2 will take significantly less time to make. The original game was more than five years in the making, but Brendan McNamara, Team Bondi's founder, says that part of what took so long was creating the tools to make a game like LA Noire in the first place. Even with the new technology, he thought the process would take less time - just a couple of years- and that it would enable actors to perform as they were in a movie or TV show. Sadly, one area where Team Bondi isn't going to be able to save any time is the game's script. McNamara said that the branching conversations, with all their lies, half-truths, and misdirection, meant that the script had to cover a lot of ground. "The writing part you can't really make any shorter," he said. "The script by its nature is three times as long because you have these different avenues and there are a lot of logical problems to that, as well." But despite taking so long to achieve, getting a sense of realism into LA Noire was high up on Team Bondi's checklist, as was injecting a little but more personality into the proceedings. "Generally videogame characters are 2D cutouts that carry big guns and do one liners," McNamara said. "So to bring that degree of humanity to these characters was a big goal for the game." 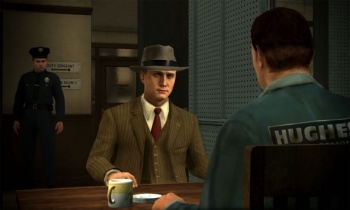 With LA Noire having the honor of being the first videogame to recognized by the Tribeca Film Festival, it seems like Team Bondi might just be on to something.